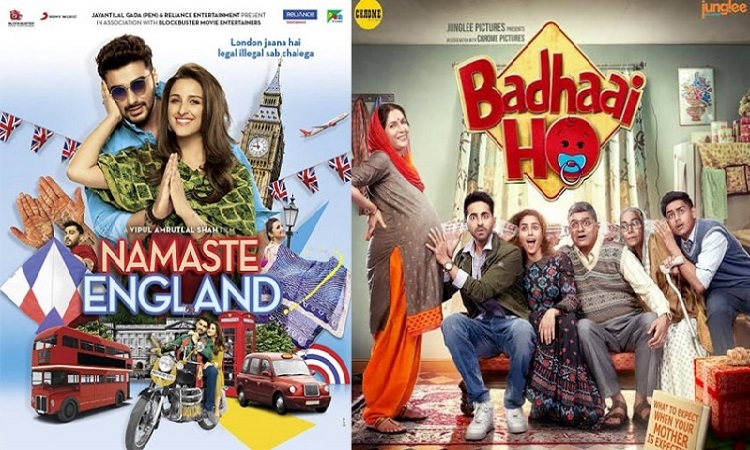 In what could be considered a Dussehra 'dhamaka', the two big Hindi releases this week, Vipul Shah's "Namaste England" and Amit Sharma's "Badhai Ho" have been given a last-minute early release. Instead of the two films opening on October 19 as per schedule, the two producers have taken a joint decision to release their respective films a day ahead, on October 18. "Namaste England" director Vipul Shah explained: "It was a very natural move. This year, Dussehra is being celebrated on both October 18 and October 19, so we decided to let the audience enjoy the film on both days." The decision was mutual, with both the producers equally gung-ho about the change. "Badhai Ho" is a naughty comedy about the embarrassment faced by a family when the matriarch becomes pregnant at an age when she is eligible for grandmotherly joys. Ayushmann Khurrana, now identified with quirky comedies and fresh on the heels of the success of his last release "Andhadhun", plays the lead. "Namaste England" is the breezy follow-up to the 2007 hit "Namastey London", with Arjun Kapoor and Parineeti Chopra taking the place of Akshay Kumar and Katrina Kaif.